The second edition of the Frigid Classic, hosted by Jeff Bales & Ken Cheney, was once again held at the outdoor roller rink in Fredericktowne Village Park in Frederick MD. Unlike the snow that preceded last year's event the skies were quite clear this time out. It was quite cold though and the temps dropped down to just above freezing, but that's what the Frigid Classic is all about! The prelims kicked off at 8:30am and featured the newly-formed Lazers taking on the returning champions in the Bulldogs. The Lazers, who would soon find their way, were overmatched in this contest the Bulldogs prevailed 6-0. Rokos and linemate Roger Marks would be trouble all day and tallied all six of the Bulldogs goals in this one. Defensive stalwart Ryan Callahan, who led last year's tourney with eight assists, chipped in four assists to start the day. Next up was 187 against the Jesters. The Jesters, led by Drake Deming's two goals, took a 5-2 lead into halftime and cruised to the 6-3 victory in this one. The next contest was a hard fought one between the Bulldogs and the Snipers, buoyed by Pittsburgh imports Jason Jaworski and Bryan Robbins. Jaworski's two tallies help make this a 4-3 contest, but Rokos' third goal of the game with five minutes remaining sealed the deal at 5-3. In the fourth game the Lazers, locked at 1-1 with 187 at the half, pulled away on the strength of a hat trick by Tony Mazziot and won 6-1. A thrilling contest followed between the Bulldogs and Jesters. This defensive struggle saw the Jesters take a 1-0 lead into halftime, but a late second period goal by the Bulldogs tied it up at 2-2. The first five-man shootout of the day - but not the last - was won by the Bulldogs 2-0 thank to the spectacular play of young netminder Julio Fernandez. The Jesters lost more than the game as goaltender Jason Worley left with an ankle injury. His day was done. Next up was the Lazers taking on the Snipers. The "even-steven" game ended in a 2-2 tie, although the Lazers finished with game with Ricketson and boys threatening on the powerplay. The shootout was settled in the sixth round and taken by the Lazers 3-2. Team 187 tightened up significantly on defense in the next contest against the Bulldogs. 187 kept in close while facing a 2-1 hole late in the game, but an empty net goal ended this one in their disfavor 3-1. The Snipers returned to the rink and jumped all over the Worley-less Jesters in the next game. Jaworski blasted home four goals to lead his team to a 6-2 victory. 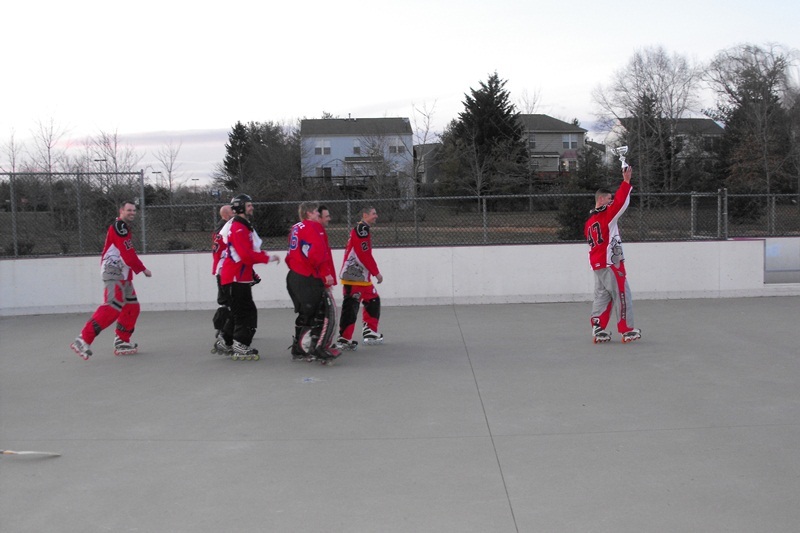 With no layoff the Snipers stayed on the rink for the next game to face a rejuvenated 187 squad. Team 187 took a 2-0 lead into the half, but the Snipers woke up in the second half to force a 4-4 result. 187 prevailed in the shootout 2-0. Jaworski tallied two goals, but 187 and Frigid newcomer Jason Gresczyk was the star of the game with four goals - including a long range shorthanded tally. In the last prelim game of the day the Lazers and Jesters faced off in another close game that ended knotted up 2-2. 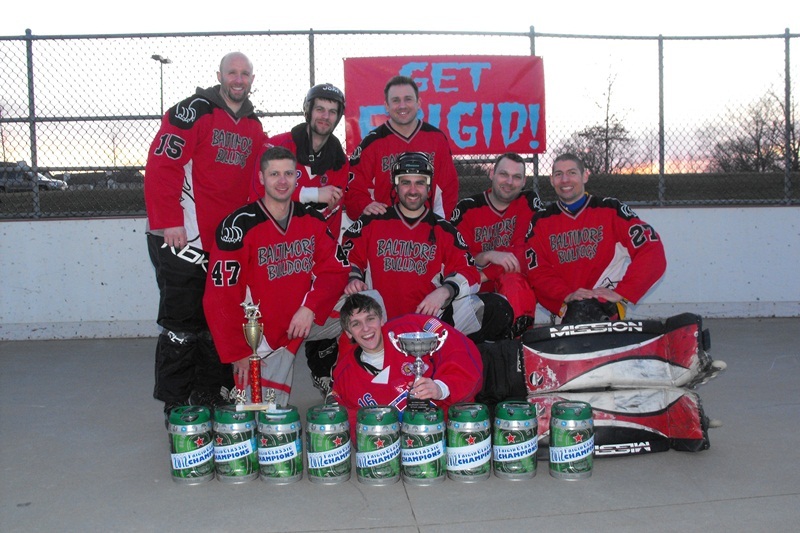 The Lazers, led by the play of forward Tom Brady, took this one in the sixth round of the shootout to finish in a surprising 2nd place. The 4th place Jesters and 5th place Team 187 faced off in a mini-game to determine who would advance to challenge the 1st place Bulldogs. This was a thrilling fast-paced game that ended 1-1 with tallies by the Jester's Deming and 187's Gresczyk. A five-minute 4-on-4 OT followed by a three-min 3-on-3 OT did nothing to settle this contest. The Jesters, on the strength of a 2-1 shootout win, escaped with the victory in one of most thrilling games of the day. The Jesters were rewarded by having to face a well-rested 1st seed, and the Bulldogs wasted no time in going up 1-0 in the opening minute. The Jesters kept it close and were down 2-0 at halftime. The Bulldogs, led in this one by the play of goaltender Fernandez, pulled away to take a 4-0 led in the second. The Jesters staged a late rally to make it 4-2, but this one ended with the Bulldogs out in front 5-2. The next semi-final matchup featured the two most surprising teams of the day in the 2nd seed Lazers lacing 'em up against the 3rd seed Snipers. Their earlier matchup, won by the Lazers, was a straight-up even affair and took OT in the shootout to determine a winner. The Snipers came out firing on all cylinders in this one, but the Lazers held it together to manage only being down 2-1 at the half. Jaworski lit it up the rest of the way and scored four goals to finish with a tournament high five in this contest. The lopsided game ended in a 7-2 Snipers victory. The thrown-together Lazers, finishing with a 3-2 record, proved to be a worthy team though. While a hard charging Snipers team went all out against the Lazers, the conniving Bulldogs rested and took it all in - and it soon showed. Coming into this one the Snipers' Jaworski (13 goals) and the Bulldogs' Rokos (11 goals) were neck-in-neck for the MVP award, with the Bulldogs' netminder Fernandez (5-0 Record 2.00 GAA) also in the mix. Rokos scored in the opening minute for the second straight game, this time against a worn-out Snipers team. A relentless Bulldogs attack made a statement by taking a 5-1 into the half. The Bulldogs, led by Rokos' four goals and another three from Marks, never let up and cruised to an easy 8-1 walloping. 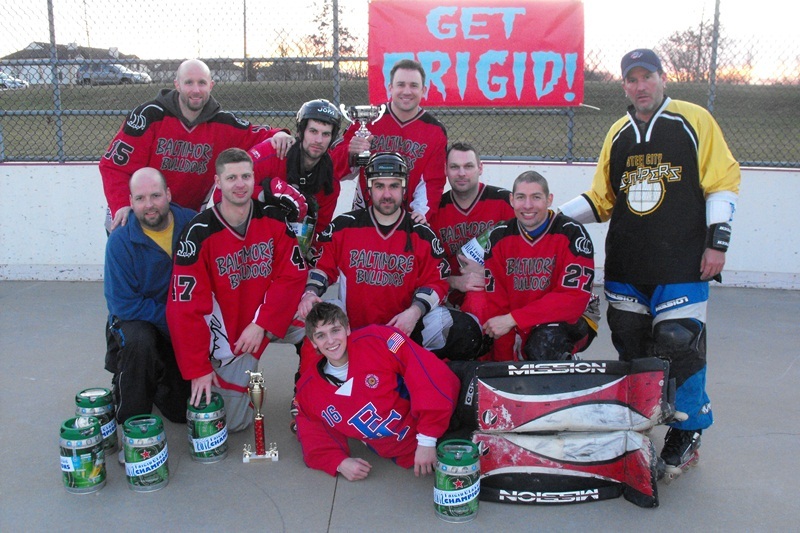 The undefeated Bulldogs won their second straight Frigid Classic Championship and Rokos took home the "Top Dog" MVP award. Fernandez, who was awarded the MVG award, could have won the MVP award had the Snipers put forth more of a battle. The Bulldogs won this year's event going 6-0 while scoring 29 goals and giving up only 11 in return.